Kentucky guard Jamal Murray works out in preparation for the 2016 NBA Draft in New York City. 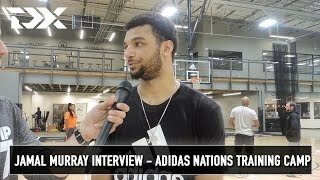 An interview with Canadian shooting guard prospect Jamal Murray of the World Select Team at the 2015 Nike Hoop Summit. Fairly quiet in the first two days, Jamal Murray came alive today, showcasing his extremely impressive skill-level that has him ranked as one of the top guard prospects in the 2016 high school class. Murray is clearly more comfortable at this stage with the ball in his hands, as he tends to get quiet and somewhat passive when he isn't the focal point of the action. Playing a heavy ball-handling role, Murray made some slick passes out of the pick and roll, a beautiful turnaround jumper in the post, and a series of gorgeous floaters from the free throw line area. He capped that off with an open 3-pointer and even hit a miracle half-court buzzer-beater to finish off the scrimmage, putting an exclamation point on what was a terrific all-around performance. While not an exceptional athlete, Murray is extremely smooth and does a terrific job of playing at different speeds, relying more on his high skill-level and strong feel for the game. He shows the ability to make some creative passes, and is relatively active and competitive on defense, which helps considering he doesn't have tremendous length with his 6-7 wingspan and especially his 8-2 ½ standing reach, relatively average for either guard spot. Talking to Murray, he had absolutely zero interest in discussing the topic of which class he will end up in, instead preferring to thoughtfully talk about a variety of issues revolving around Canadian basketball, the path he's taking as somewhat of a trendsetter in his home country, and his own personal growth as a player. We will release that interview in the coming days. -Jamal Murray possesses excellent size for a player who can play a bit of point guard. He's almost exactly the same size as Austin Rivers, who measured 6'5 in shoes with a 203-pound frame and a 6'7 wingspan coming out of Duke. His standing reach of 8-2 ½ is certainly on the small side, even if his overall dimensions are similar to those of Kirk Hinrich for example. Highlights of 6-5 Canadian guard Jamal Murray from the 2015 Basketball Without Borders Global Camp in New York City during NBA All-Star Weekend. Murray was arguably the top performer at the Camp, impressing with his improved playmaking ability and defense to go along with his outstanding scoring instincts and deep shooting range. -Canadian swingmen Jamal Murray and Justin Jackson are two of the country's top rising talents. Murray made an impression at the 2013 Jordan Brand International game scoring 24 points before getting an invite to last year's Nike Hoop Summit. A scoring guard with a terrific jump shot, rumors continue to swirl that Murray will reclassify from the class of 2016 to the class of 2015 and play college basketball next season. Murray isn't a particularly impressive athlete or defender, but highly fluid guards who can put points on the board in bunches from the perimeter like him are very much en vogue these days, and Murray has the scoring instincts and smarts to compensate for his limitations.